First level of the case features Le Prisme Visage Mat in Beige Mousseline 84 and Le Prisme Blush. Le Prisme Visage Mat in Beige Mousseline 84 has four shades that combine to form a unique blend that presents subtle and attractive harmonies for maximum radiance. So soft, so incredibly fine! Le Prisme Blush is a gorgeous and fresh pink powder that offers extreme softness and an absolutely beautifully smooth texture that applies evenly. Second level of the case features Le Prisme Mono Eyeshadows -Infinite Finishes ,7 beautiful shades with matte, iridescent, pearlescent, and glitter texture. The eyeshadows are very small but with super soft, pressed-powder texture that blends on smoothly and doesn’t flake. The last level of the case features a mini black Khol, a mini mascara 4 in 1 and a mini ultra shiny lip gloss. Givenchy Magic Khol in black is a long-lasting, pigment-rich eyeliner. Givenchy 4 in 1 mascara in Noir Couture is my new favorite mascara. 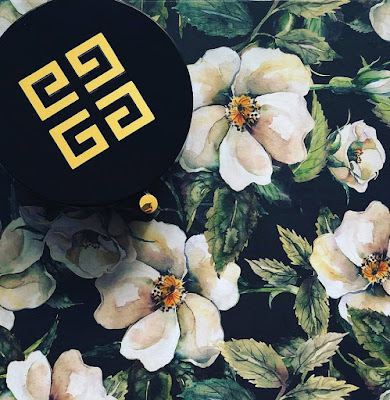 This multitasking mascara is formulated with Givenchy’s exclusive lash booster expert complex that provides nutrition, revitalization, fortification, and protection. This is an amazing four-in-one mascara that creates intense volume, strong curl, infinite length, and complete lash care. I simply love this mascara, is my favorite item from the entire case. Givenchy Ultra Shiny Color Plumping Effect in 01 Capricious Pink provides spectacular shine and leaves lips smoothed and plumped. The formula is enriched with high-performance skincare ingredients developed by Givenchy Laboratories. I love the color and the light formula of this gloss but the brush applicator is way to hard and annoying to use. Despite the fact that this mini gloss has 3,5 ml there is enough product to use for a year, except for when you eat lip gloss on bread! The case itself is elegant, sophisticated, has a great design.Almost every makeup item from the case is scented.The fragrance is composed of top notes of bergamot, litchi, and red fruit; middle notes of rose, jasmine, and lily of the valley; and base notes of sandalwood, vanilla, amber, and musk. This was a great birthday gift from myself to myself :) and I think for Christmas I will probably have something similar on my wish list. 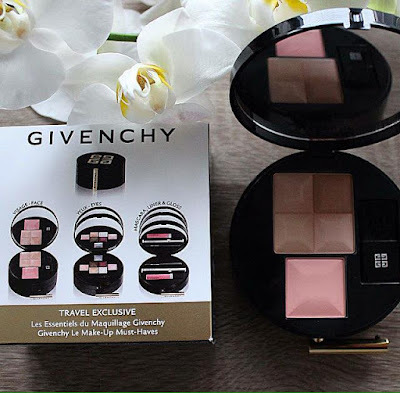 Givenchy Glamour On the Go 3 Step Makeup Palette is a 5 star product and one of my best beauty buys so far, unfortunately is limited edition and it can't be purchased in shops or online. I have seen it on Ebay for 160 $ but from what I know LVMH doesn't license Ebay or Amazon to sale any Givenchy items. This is not a sponsored post . All opinions are my own and I genuinely like and use this product. Oh my! It looks divine! Great purchase! I would have brought it too! This looks so amazing, I envy you a little bit :) Good gift idea for Christmas. Yess, me also. I am crazy about it ! How beautiful! I love spoiling myself like this too.. :D :D a gift from self to self! This is beautiful! It would be perfect for travelling with :) the eyeshadows look super pretty. This is beautiful! I’m so getting this!! You might still find it, maybe in airports. Unfortunately it was a limited edition.